This week after the GSTL cast the first episode of "Project A" was aired. I hadn't planned to watch it because I had to get back to studying for mid-terms but after seeing this opening intro I was intrigued. If you have seen Asian TV before you should be well aware of their crazy campy steal of programs, which made this incredibly amusing to watch. 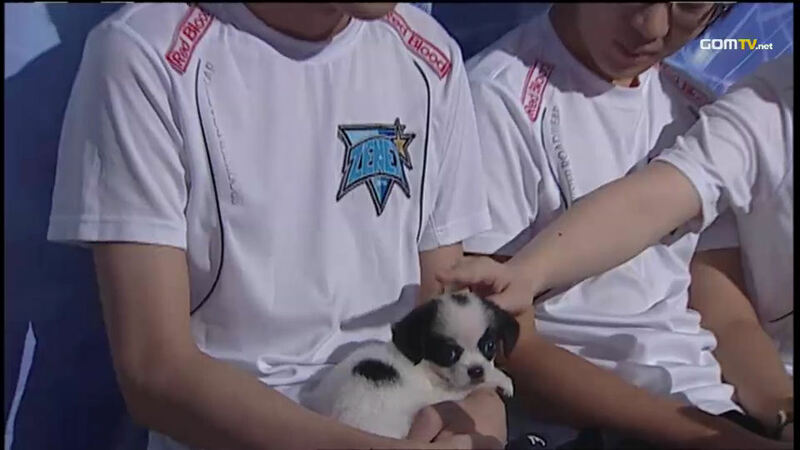 The night had started off quite amusing already with the GSTL team Zenex bring their new house puppy to the set of professional Starcraft Team Leagues but the following Project A was the real highlight of that nights broadcast. Your argument is invalid, our team has a puppy. Yay Zenex Puppy! But back on topic, Project A is a show about old Broodwar Pro Yellow getting into Starcraft 2, after his recent retirement from Starcraft 1. He is trying to get to Code A within a month which will be no easy feat, and the show is about how he is going to train and work towards becoming a star in the new SC2 Korean Pro Scene. Depending on the race he picks he has a line up of pro coaches to choice from, like JulyZerg. It looks to be a fairly interesting show, which I intend to watch. If you're interested in watching the mini series you can catch it on GOMTV.net every week after GSTL or watch the VODs from their website for free, only takes a few seconds to registrer and allows you to watch Project A or regular Starcraft Streams and the first match in Starcraft series for free. Part of the fun of watching a foreign broadcast is always the things that are lost in translation, which Project A looking to be no exception. Looks pretty good. I'm a fan of a lot of Asian shows, especially Japanese dramas, but usually a mistranslation like that doesn't happen. Their rarity makes them much more amusing. The subs are usually... interesting on foreign shows. I don't even know what to think about that last picture. When I heard Project A I thought your blog was gonna be about the Jackie Chan movie Project A! Definitely checking out those links. When I get Starcraft then maybe I'll start watching these.